80 Cents per Text to Other Networks Regular Rate Starting November 10, 2011! 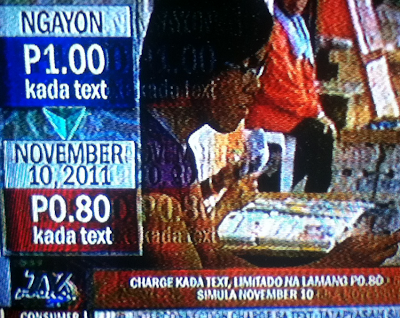 Starting November 10 this year, the regular rate for sending one text message to another network will be 80 centavos instead of the current 1 peso rate. Caught this on TV Patrol earlier this evening. This will perhaps be the direct result of the imminent reduction in interconnection charges amongst network providers from 35 centavos to just 15 cents. 20 cents off. Are you cool with that, TP Friends? Or do you think we deserve a bigger price cut?